Which one? He just says the biscuits... we feed them to the babies, soak 1 in hot water, and feed 1 every day for 3-4 weeks. The MAZURI website has like 20 diff kinds. And then some other bird websites have "monkey chow" but no nutritional information. Please help, we want the best for our rescue baby. Weight gain, UC2 monkey chow? I am not a dietician. Perhaps Harrison's Recovery Formula, salmon, pasta and banana etc for a healthy mixed diet? Casper loves the last three but only gets very little because he puts on weight very easily. Are you checking your birds weight regularly, I would suggest at least every couple of days whilst waiting for the op. Last edited by Casper's 2nd best friend; 09-06-2018 at 03:58 PM. Hey Casper, we just got her Friday. So I have not really checked weight. But shes around 520 grams??? Needs 200 more vet says...... what kind of scale should I Purchase for that? Your vet is obviously giving you far more expert advice than me and they know what you can get locally. We don't have Mazuri products in the UK. I mentioned the fresh produce as they will add some variety and those are items that the vet said Casper shouldn't have to much of when he was overweight. As for scales, we use a set of kitchen scales which you can reset to zero after putting on a perch of some sort for your bird to sit on. You can alternatively put the bird in a box or dish with treats to keep from wandering off. Casper has got so used to being plonked on that he no longer demands the almond nut treat that we used to have to bribe him with. Here he is demonstrating for you. Last edited by Casper's 2nd best friend; 09-06-2018 at 08:43 PM. I edited my weighing text after your thank you. Thank you for the thank you. Thank you, we got a standard kitchen scale for $8 on AMAZON. 5 grams to 22lbs is more than enough. And shes pretty good staying for a minute. 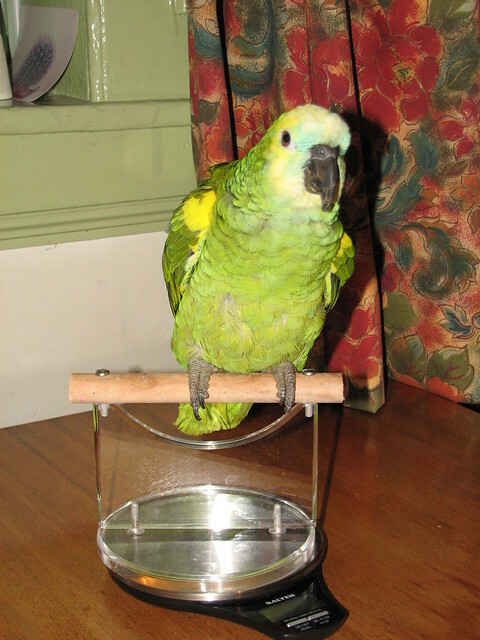 But if the scale doesnt register quick enough we can make a perch stand out of the extra dowels we have from her cage :-) and reset when we position it. Casper has put on 10 grams since last Friday. No banana for him this week!